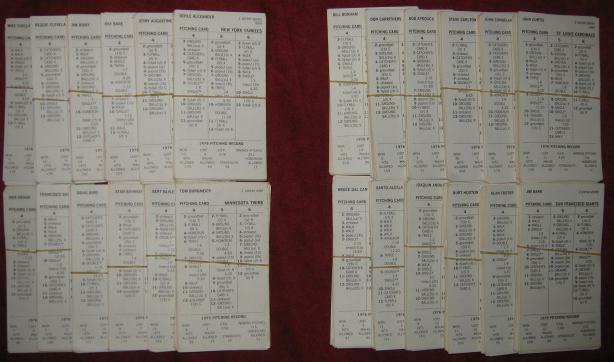 STRAT-O-MATIC has been producing statistical replay games since 1962. The baseball game first came out in 1962. These games are very detailed and highly realistic yet they are flexible enough to allow you to play at the level of complexity with which you are most comfortable. There have been numerous changes to the game over the years and you should be aware that not all cards sets are 100% compatible with all editions of the game. This listing is for a card set for use with the Strat-O-Matic Baseball Game. You need to already own the game to use it. If you don't already have a copy of the game just click HERE to see a list of complete games that I have available for purchase. The card set is overall in GOOD condition. This is a near complete set of player cards reflecting the 1970 season stats. These are the original 1-sided cards - no advanced side. This set includes a partial additional player set. It also includes a photocopy of the original roster sheet. I have inventoried and inspected the cards and every card from the basic set has been accounted for except for the following 6 cards: Kaat MIN, Jenkins CHC, Seaver NYM, Gibson STL, Allen STL and Perry SF. The NL has all the additional players except for those on the Dodgers. The AL has no additional players. About 20% of the cards have a pencil notation at the top or bottom. Most cards are yellowed at the very edge. This yellowing extends up to 1/8 inch onto the face of some cards. 1-2 cards per team have rubber band stains. About 30 cards show heavy use with yellowing, fingerprints or other stains and rounded corners. A couple others have heavy creases or a small edge tear. All card results are fully readable. I would grade them 4 on a 10 scale (see condition guide below).